Quick. 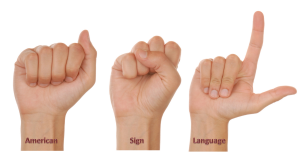 When’s the last time you had a conversation in sign language? If you’re like the majority of Americans, your answer to that is most likely “never”. Maybe you learned a little in elementary school– enough to perform a song, or say the alphabet– but unless you’re deaf yourself, or have a deaf family member, chances are you never learned to converse. The hearing community tends to rely on the deaf to be able to lip read, or to have an interpreter. This is in spite of the fact that between 500,000 and 2 million Americans communicate primarily in ASL. In fact, more Americans use Mandarin Chinese in their daily communication than ASL. Many family members of the deaf don’t even learn ASL. The question remains: why not? Well, that question may be about to become moot. Thanks to an enterprising pair of undergraduate students at the University of Washington, the hearing impaired and the hearing-privileged may finally be able to communicate freely and easily, without any of that pesky learning curve. They call their invention “SignAloud”. The idea is so simple and elegant that it’s a wonder no one came up with it sooner: a set of gloves which translate sign language gestures into audible speech. As recently as 10 years ago, devices like these would have been seen as sci-fi flights of fancy, but as computer technology continues to decrease in size, technology is able to advance that much quicker. The gloves are lightweight, with sensors throughout the fingers and a computing system around the wrists. The sensors detect gestures and translate them into speech. The goal is to make them as lightweight and ergonomic as possible, allowing them to become an everyday use item, such as glasses or a hearing aid. While right now, the gloves can only translate a few hundred words, the future is bright. With any luck, we will see this device hit the market soon, and open up a whole new world of communication.